The low-profile Balcony Gard uses quiet ultrasonic sounds to repel annoying birds from small outdoor areas around the home! 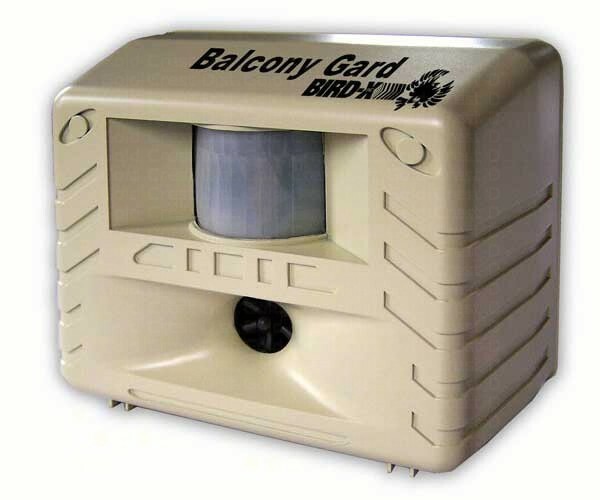 The Balcony Gard has a motion-sensor setting along with the standard, continuous setting. The Balcony Gard is weather-resistant and fully programmable. The convenient and flexible coverage makes it perfect for small residential spaces like balconies or patios. Plus, it comes with a 30-Day satisfaction guarantee to assure your unwanted guests are gone for good! Use with included power cord, or supply your own “C” batteries (4 x 1.5V) for a cordless device.